Recommended citation: Alonso Canal L, Carreras Sáez I, Fournier del Castill MC, Asensio Antón J, de Prada Vicente I, Isasi Zaragoza C, Tejada Gallego J, Martínez Gómez MJ. Gluten-Free Diet for the Treatment of ADHD; Pilot Study. OBM Neurobiology 2019;3(2):10; doi:10.21926/obm.neurobiol.1902024. Background: The association between Attention Deficit Hyperactivity Disorder (ADHD) and celiac disease has already been established. Non-celiac gluten sensitivity (NCGS), as well as celiac disease, has been associated with neuro-psychiatric disorders. Our objective is to assess if a proportion of pediatric ADHD patients are affected by NCGS and could consequently benefit from a gluten-free diet. Methods: Pilot study of 6 ADHD patients. Personal or family history suggestive of NCGS was investigated. The Conners Continuous Performance Test II (CPT-II) was performed to assess the ADHD clinical picture. Celiac serology and celiac susceptibility HLA blood analysis was performed, as well as upper gastrointestinal endoscopy. Regardless of the results obtained, everyone followed a gluten-free diet for 4 months. After this time, patients and their relatives were questioned about changes experienced in the symptomatology and a new CPT-II was performed. Results: The 6 patients presented digestive symptoms and 2 reported headache. Celiac serology was negative in all patients. Four patients had iron deficiency. Four patients were DQ2+. In addition, 5 patients had gastritis due to H. Pylori. All patients reported the disappearance of the digestive symptoms and headaches disappeared in the 2 affected patients. Three patients confirmed improvement in ADHD symptomatology. No statistically significant changes were observed when comparing the results in the CPT-II pre- and post-intervention. Conclusions: Patients with ADHD seemed to improve their gastrointestinal symptoms with a gluten-free diet and on occasion, also their ADHD symptoms. Non-celiac gluten sensitivity should be ruled out in ADHD patients. Attention Deficit Hyperactivity Disorder (ADHD) is a neurobiological disorder that begins in childhood and affects between 3-7% of school-aged children. It is characterized by a level of impulsivity, activity and attention not suited to the age of development. Many children and adolescents with ADHD have difficulties regulating their behavior and adjusting to the norms expected for their age and as a consequence, they have difficulties with adaptation in their family and school environments and in their relationships with their peers. They often perform below their abilities and may exhibit emotional and behavioral disorders . In the ethiopathogenesis, the interrelation of multiple genetic and environmental factors has been implicated. In addition, ADHD is considered a heterogeneous disorder with different subtypes resulting from different combinations of risk factors that act at the same time. It has been postulated that the origin of ADHD is due to a dysfunction of the prefrontal cortex and its frontostriatal connections. Moreover, it is considered a disorder of cortical maturation rather than a deviation in development . The diagnostic criteria used are those of the Diagnostic and Statistical Manual of Mental Disorders – 5th edition (DSM-V) and the International Classification of Mental and Behavioural Disorders - 11th revision (ICD-11) classifications. According to these classifications the patient must present 6 or more symptoms of inattention (5 or more if 17 y/o or older) and/or 6 or more symptoms of hyperactivity-impulsivity (5 or more if 17 y/o or older). The symptoms must have been present for at least 6 months to an extent that is disruptive and inappropriate for the person´s developmental level. Some of the symptoms must have appeared before age 12 (before mid-childhood for ICD-11), must be present in two or more settings, and must reduce the quality of social, school or work functioning. Other mental disorders (such as schizophrenia, mood disorders or a personality disorder) must be ruled out. Based on the types of symptoms, 3 kinds of ADHD can occur for DSM-V: predominantly inattentive, predominantly hyperactive-impulsive and combined. For ICD-11, there are 5 kinds since it includes “other specified” and “unspecified” as further possible presentations. The treatment is multidisciplinary: psychopedagogical (including patient, family and teachers) and pharmacological (mainly methylphenidate and atomoxetine). The combination of this treatment (multimodal) has shown limited long-term results (at 6 and 8 years of follow-up) [2,3]. Celiac disease (CD) is a chronic inflammatory autoimmune disease affecting the mucosa of the small intestine, triggered by the intake of gluten in genetically predisposed individuals. The current diagnostic criteria for celiac disease include: Tissue antitransglutaminase antibodies (anti-TG) and a positive and compatible biopsy (there is the possibility of diagnosing without the need for a biopsy in the case of detecting anti-TG antibodies greater than 10 times the normal levels, together with positive antiendomysial antibodies, compatible clinical symptoms and the presence of human leukocyte antigen (HLA) DQ2 or DQ8 haplotypes) . Interestingly, CD may present symptoms similar to those of ADHD in a significant percentage of patients prior to the start of a gluten-free diet . Therefore, despite the different views on this topic, some scientist advise to screen for this disease in the study of patients with suspected ADHD  (via Tissue anti-TG IgA antibody determination during normal practice). Other neurological and psychiatric manifestations of celiac disease include: peripheral neuropathy, ataxia, seizures, migraine, depression, autism spectrum disorders, anxiety disorders and schizophrenia [3,5,6,7]. Non-celiac gluten sensitivity (NCGS) is a recently recognized pathology whose clinical manifestations can be similar to patients with ADHD (difficulty in concentrating and "foggy mind" described in the adult population ). It has not yet been established as a condition by all of the scientific community. It is a clinical picture that groups various morphological, functional and immunological alterations in which some pieces are missing to diagnose celiac disease, however, patients respond to a gluten-free diet. It is very possible that this term ceases to exist as we advance in the knowledge of the pathology induced by gluten and give way to different well-defined entities . The underlying causative immune mechanism is unknown but it is believed that the main role is given to the innate and non-adaptive anti-gluten immunity. One hypothesis is that in NCGS, as there is no adaptive immune response, there is no damage to the intestinal mucosa, however there could be an indirect harm to the intestinal epithelium not mediated by the presence of specific antibodies. There is no diagnostic test alone that confirms or rules out non-celiac gluten sensitivity. The hypothesis proposed in this study is that NCGS—which in adult patients can be clinically compatible with irritable bowel syndrome [9,10] or fibromyalgia/chronic fatigue —in the pediatric population can manifest as ADHD. A pilot study was conducted with 6 patients diagnosed with ADHD. This diagnosis was made by a specialist in pediatric neurology or in child psychiatry based on the criteria of the DSM V classification ("Diagnostic and Statistical Manual of Mental Disorders-Fifth Edition"). The patients showed clinical symptoms for more than 6 months and other possible causes of the condition were ruled out. The presence of significant psychiatric or severe neurological co-morbidity, as well as the presence of serious infectious or tumoral pathology were considered as exclusion criteria. Patients were between 9 and 13 years of age. The concomitant pharmacological and/or psychopedagogical treatment was not considered as an exclusion criteria. The treatment that the patient followed was noted and care was taken that this treatment was not modified for the duration of the study. All of the parents of the patients, as well as the patients older than 12 years, signed an informed consent to be part of the study. The Conners Continuous Performance Test II (CPT-II) was performed on all patients to assess the ADHD symptoms. This test consists of a standardized computerized test that evaluates the degree of attention and impulsiveness that an individual has. The subject must constantly confirm the target stimuli, and refrain when the non-target stimulus appears. Likewise, the BRIEF questionnaire was answered by parents and teachers to evaluate the executive functions in ADHD (questionnaire that inquires about how the subject develops with possible ADHD in their daily life from the point of view of parents and teachers). We investigated personal or family history suggestive of NCGS: first or second degree family member with diagnosis of celiac disease, presence of vitiligo, psoriasis, recurrent mouth ulcers, history of immune thrombocytopenia (ITP), digestive symptoms (irritable bowel, abdominal distension, gastroesophageal reflux), severe migraines, history of chronic iron deficiency, and among others. A general physical examination was carried out including an anthropometric assessment. Blood tests were performed including blood count, liver profile, renal function, ferric profile, total cholesterol, folic acid, vitamin B12, thyroid function, wheat IgE, anti-thyroid and anti-nuclear antibodies, rheumatoid factor and trace elements (zinc and copper). Serology of celiac disease was requested: anti-TG IgA (IgG if deficiency of IgA confirmed), native antigliadin IgG and deamidated gliadin peptides. HLA susceptibility to celiac disease was determined in all patients. All patients underwent upper gastrointestinal endoscopy with duodenal and antral biopsies. In the duodenal biopsies, immunohistochemical studies were carried out in relation to gluten sensitivity (proportion of CD3 lymphocytes). Regardless of the results obtained, all patients followed a gluten-free diet (GFD) for 4 months. The diet was monitored by the Celiac and Gluten Sensitivity Association in Madrid. After this time, the patients and their relatives were questioned about the changes experienced in the symptomatology. In addition, a new CPT-II test and a new BRIEF questionnaire (parents and teachers) were carried out. The study was reviewed and approved by the Research and Ethics Committee of our center (Comité Ético de Investigación Clínica HNJ internal code number R-0053/12). The statistical analysis was performed using the SPSS program version 21.0. There were 3 female and 3 male patients. The mean age was 10 years. They all suffered ADHD symptoms for at least 2 years prior. The 6 patients reported digestive symptoms (mainly recurrent abdominal pain in the mesogastrium) and 2 had headaches (Table 1). Table 1 Patient characteristics, result of complementary tests, and response to the diet. Two of the patients had a first-degree relative affected with non-celiac gluten sensitivity. The celiac serology was negative in all patients (including the native antigliadin type IgG). An IgE-mediated wheat allergy was found in 1 patient. This patient also had allergies to other cereals (mainly rice) and to pneumoallergens. As a characteristic symptom, he had dry cough after the ingestion of foods battered in wheat flour. Ferropenia was found in 4 of the patients. Regarding the genetic susceptibility to celiac disease, 4 patients presented the haplotype DQA1 02, DQB1 02; also called haplotype 'DQ2.2', which confers moderate risk of celiac disease. The remaining 2 patients had the allele DQA1 05:05 in isolation; HLA DQ7.5 haplotype. Five patients had gastritis due to Helicobacter pylori, 3 of which had received eradication therapy. The other 2 patients rejected such treatment due to not having digestive symptoms after the start of the dietary intervention. All patients had a normal duodenum biopsy (with a normal intraepithelial lymphocyte count). All patients reported the disappearance of the digestive symptoms. One of the patients attributed the disappearance of their digestive symptoms (isolated epigastralgia) to the Helicobacter pylori eradication therapy. The headache disappeared in the two patients who suffered from it. In addition, 3 patients reported subjective improvement in ADHD symptoms (especially in the area of attention). This improvement was also perceived by the parents. 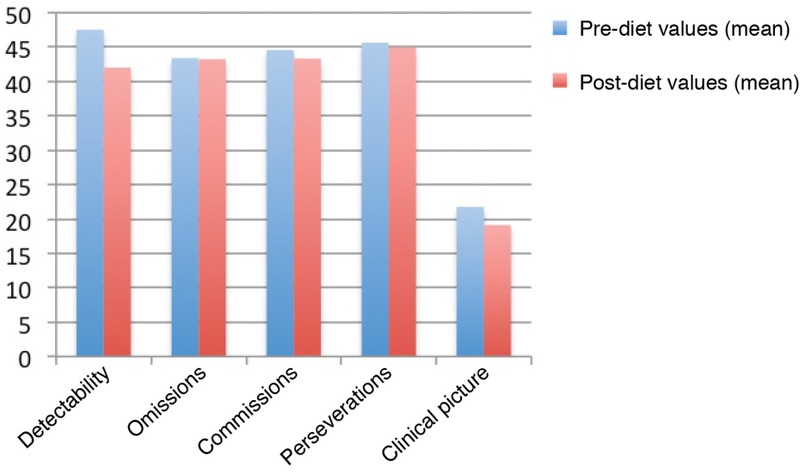 Comparing the scores in the pre-intervention CPT-II with the post-intervention scores, improvement was observed in all areas but none reached statistical significance (Wilcoxon test; Figure 1). Figure 1 CPT II results before and after intervention. In the parents' BRIEF questionnaire, significant improvements in operative memory were observed. In the other areas, with the exception of the global executive composite, improvement was observed but it did not reach statistical significance (Wilcoxon test; Figure 2). Figure 2 BRIEF questionnaire for parents. In the professors' BRIEF questionnaire, significant improvements in emotional control and planning were observed. In the other areas, improvement was observed, however it did not reach statistical significance (Wilcoxon test; Figure 3). One year after the end of the study, the 3 patients who showed clinical improvement in the ADHD symptomatology continued with a gluten-free diet on a voluntary basis. Figure 3 BRIEF questionnaire for teachers. Previous intervention studies with an elimination gluten-free diet in hyperactive children have shown good results . A gluten-free diet has also proven to be beneficial in Tourette´s Syndrome  and in some patients showing autistic features . This study is, as far as we know, the first study in patients with ADHD that includes performing a duodenal biopsy as a technique for screening for celiac disease in patients with negative celiac serology, prior to an intervention with a gluten-free diet. The main disadvantage of this study is the small sample size. Because of this, the probability of finding statistically significant pre-test differences was very low. As a second fault, it should be noted that the study was not blinded and did not have a control arm. The blinded intervention in intervention studies with a gluten-free diet is usually carried out with capsules of similar appearance that contain either wheat flour or gluten-free cereal . Given the scarcity of the resources that we had, we were not able to perform the study using gluten/placebo capsules. The intervention blinded with ordinary foods with and without gluten is not possible for children of advanced ages, such as those who participated in our study. Four patients had iron deficiency. Iron deficiency has been related to restless legs syndrome and ADHD . Our patients did not receive treatment with iron supplements during the study. It is conceivable that the presence of iron deficiency in patients with ADHD could be a consequence of damage to the intestinal epithelium (due to gluten-sensitive enteropathy, and among other causes) and not a cause of ADHD. The eradication treatment of Helicobacter Pylori could have been a confounding factor. However, it should be noted that 2 of the patients with gastritis induced by this microorganism rejected the eradication treatment that was offered to them when their digestive symptoms disappeared with the dietetic intervention. Recurrent abdominal pain in the mesogastrium routinely labeled as "functional" does not respond to eradication therapy (it is not indicated to rule out H. pylori infection in children with recurrent abdominal pain and the eradication of H. pylori in such children has not proven beneficial for the improvement of the symptomatology ). The only patient who did have epigastralgia was the one who attributed the improvement in their symptoms to the eradication treatment. In our environment, around 30-40% of the population has susceptibility alleles to celiac disease DQ2 (either the complete form as DQA105, DQB102 or partial form DQA102, DQB102) or DQ8. In our study, 4 of the 6 patients had the DQ2 allele. The other two patients had the allele DQA10505 in isolation. Cases of celiac patients have been reported with the isolated presence of this single allele . Finally, there is a growing group of experts that denies the existence of the entity labeled "ADHD" and suggests that it is a "hotchpotch" that covers patients with very diverse pathologies but with some similar symptoms in which complementary tests obtain normal results. Our patients, according to this vision, might not have been correctly diagnosed. However, it can be said that they were patients who had been diagnosed in hospitals by the experts in the area and all, with the exception of one, followed pharmacological treatment for this condition. Thus, whether "ADHD" or a "hotchpotch" brings children together with common symptoms in which the usual studies do not get abnormal results, the issue is that the proportion of children in our environment with these types of difficulties in learning and behavior seems to be increasing . Given the lack of knowledge about etiopathogenesis and consequently, the therapeutic approach that we must follow regarding this type of condition, there is an imperative need to carry out new studies in this field. The very high prevalence that they seem to have and the uncertain prognosis of these patients with the pharmacological treatments currently established are also two aspects of great importance. Food is one of the environmental factors that has varied most in recent decades in our environment. It is not, therefore, illogical to think that in a subgroup of patients with ADHD, their symptomatology could be influenced by food. Gluten is a highly immunogenic protein whose intake by humans has increased dramatically in recent decades . We believe that it is important to investigate possible dietary interventions in ADHD given the harmlessness of this action  and the hopeful background of studies carried out in this field . The present study is a pilot study with the hope of extending to a larger sample size in the future (ideally planned for 55 patients), with a provocation phase blinded with gluten in a portion of the patients responding to the diet at the initial moment. Dietary intervention studies are difficult to perform given their frequent lack of funding, difficult monitoring and the fact that the effects of the intervention are often observed in the long term . Our conclusion, exposed with extreme caution given the small sample size, is that patients with ADHD seem to improve their gastrointestinal symptoms with a gluten-free diet and sometimes, also their ADHD symptoms. NCGS should be ruled out in ADHD patients. Laura Alonso Canal: main author of the research paper. Rest of authors contributed equally to this work. Agència d ́Informació, Avaluació i Qualitat (AIAQS) de Cataluña. Working team of the Clinical Practice Guidelines for ADHD in Children and Adolescents. Clinical Practice Guidelines for ADHD in Children and Adolescents. Clinical Practice Guidelines for the NHS: AATRM Nº 2007/18. 2010. Isasi Zaragoza C. Chronic fatigue síndrome and non-celiac gluten sensitivity: Association or cause? Reumatol Clin. 2015; 11: 184. García García MD, Prieto Tato LM, Santos Borbujo J, Monzón Corral L, Hernández Fabian A, San Feliciano Martín L. Attention deficit and hyperactivity disorder, a current problem. An Pediatr. 2008; 69: 244-250. Kasarda DD. Can an increase in celiac disease be attributed to an increase in the gluten content of wheat as a consequence of wheat breeding? J Agric Food Chem. 2013; 61: 1155–1159.